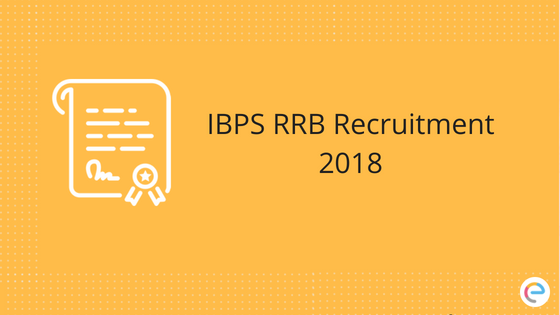 IBPS RRB Recruitment for the year 2018 has been announced. This year 5000+ vacancies across India have been issued. The fact that the IBPS RRB Recruitment notification has been issued this year gives the aspirants a huge opportunity. So it is recommended that you start preparing at the earliest. IBPS RRB Recruitment Notification 2018 for 5249 Officer Scale I, II, III and Office Assistant Posts in Regional Rural Banks (RRBs) has been released by the Institute of Banking Personnel Selection. As per the IBPS RRB Recruitment, the application process is started from today i.e. 8th June 2018 and will continue till 2nd July 2018. A total of 56 Regional Rural Banks (RRBs) are participating in this massive recruitment drive by IBPS and the detailed vacancy details of the same are given below in this article. The Institute of Banking Personnel Selection (IBPS) has released the recruitment exam notification for officers (Scale- I, II & III) and Office Assistant (Multipurpose) in Regional Rural Bank (RRB) under CRP RBs VII. There are a total of 5249 vacancies for Office Assistants & 3312 vacancies for Officers Scale I. A candidate must be Graduate in any discipline from a recognized University or any equivalent qualification recognized as such by the Central Government. The candidate should have passed in English as one of the subjects at SSC/ HSC/Intermediate/ Graduation level. Aspirants must have the passing certificate. IBPSRRB Exam is an Online Objective type. All sections (except English Language section & Hindi Language section) will be bilingual (i.e. in English & Hindi). There will be sectional as well as overall cutoffs. Negative marking of 0.25 marks is applicable on wrong answers. IBPS RRB office Assistant Prelims exam pattern is given below. IBPS RRB office Assistant Mains exam pattern is given below. IBPS RRB Officer Scale Prelims exam pattern is given below. Reasoning 40 40 Composite time of 45 minutes. IBPS RRB Officer Scale Mains exam pattern is given below. Ex-Servicemen/Disabled Ex-Servicemen Actual period of service rendered in the defense forces + 3 years (8 years for Disabled Ex-Servicemen belonging to SC/ST) subject to a maximum age limit of 50 years. The Application Fee is non-refundable. The payment must be made in online mode only. Staff candidates are exempt from payment of examination fee and intimation charges. The fee breakup is given below. We hope this detailed article on IBPS RRB Recruitment 2018 helps you. If you have any query pertaining to IBPS RRB Recruitment or exam in general feel free to post your comments below. We will get back to you at the earliest.